Results from the final round of the 2010/2011 North West League in St Helens yesterday are now available below. Congratulations to all riders and thanks to all officials for our busiest season on record! 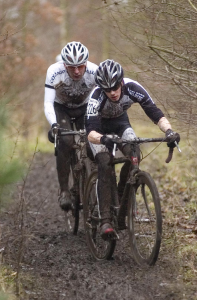 The final race of the Nest West Cyclo-Cross League returned to Sutton Park in St.Helens. The riders were welcomed by a challenging course that had been rain-soaked by heavy downpours over the preceding days. The main talking point was a very severe down hill section followed by an almost impossible off-camber sweeping bend – not for the faint hearted. The races still held plenty of meaning with some very close top of the league clashes to sort out the year’s overall standings. The day’s racing set off with the Under 12’s on a dedicated course which included many of the senior course challenges. The kids were well up for the conditions and following a rapid start the main contenders came together to battle it out. With the league title was still up for grabs. Soloman Kerfoot-Robson, Rhos-on-Sea, managed to hold off the challenge from Joseph Armstrong, Border City Wheelers, who has challenged Solomon throughout the season. Third place went to Nathan Hawthorn, Cycle Sport Pendle, closely followed by Sam Hollingsworth, Red Rose Olympic, which on the day mirrored the overall final standings for the league. First girl home and the girl’s league winner was Kim Baptista from Eastlands Velo. Next up were the Youth riders who tackled the full course. This too was a closely fought affair with visiting rider Joe Dransfield, Wakefield Tri, taking the spoils on the day closely followed by Robert Rogers and Red Rose Olympic’s Ashley Clitheroe. Robert Armstrong, Bill Nickson / Raleigh, was the first U14 rider through with a fine performance from Jessica Wilkinson, Birkenhead, as first girl. The final race of the day saw some classic action from the Seniors, Vets and Juniors. The early leader was U23 Cycle Sport Pendle rider Martin Woffindin who took advantage of the initial tarmac loop start opening up a good 20 metres on the rest of the field. The top ten included most of the league contenders who set about reeling him in over the first lap. 3 riders pulled the gap back including Giles Drake MSC Bikes and 2 Zepnat riders James Furniss and Pete Middleton. By lap 3 Drake and Furniss had forced themselves to the front with a good 30 second lead over junior Wheelbase / Cannondale rider Jack Humphreys who had made his way through the field. Further back still Senior and Vet riders Anthony Morris, Evans, Mick Style, Manchester Wheelers and Wayne Jackson were battling both against each other and the now tortuous off camber section. It was Humphreys however who seemed to surprise the two leaders by taking an almost suicidal line through the downhill / off camber section to take the lead with 3 laps to go. Drake was the first to react with Furniss not able to take the change in pace. A massive effort from Drake brought him back up to Humphreys’ wheel with just over one lap to go. Both riders attacked one another relentlessly with both hitting the ground as they approached the final single track section before the finish line. The first into the small copse of trees would be able to defend the lead to the line and it was Drake who had the strength to force his way through taking revenge for the Macclesfield Super cross result where Humphreys pipped him in a sprint finish for the NW win. It was a fitting final battle which summed up what has been a very well attended season of races in the region. The win for Drake though didn’t bring him enough league points to take the overall senior league win which went to Paul Bethell. Drakes league position was second followed in third place By Martin Woffindin (Under 23 champ) and 4th overall and Junior title winner Jack Humphreys. A big thanks must go to all the race organisers and officials who have worked together to produce one of the best seasons in the leagues history with record attendances across all age categories. I’m sure everyone is looking forward to next season (giving the washing machines time to recover…). ‹ Prize Presentation Meal- order by Wed 12th.